The action of the play centers around Henry’s campaign for the French throne and leads up to the famous battle of Agincourt. There’s never any doubt that Henry is going engage in a war between England and France – the preamble to that decision is swiftly and humorously dealt with here. It’s driven by the doubt in the minds of his followers and opponents – does Henry have the balls (Shakespeare’s joke, honest, just watch) to rise above his drunken youth and be a king? Knowledge of that doubt spurs Henry to keep a strong separation between personal and public personas. The first time that wall is breached, when he’s called upon to deal with three traitors close to him, there’s a shiver through the audience as Hayden unleashes that inner brawler. We don’t doubt he will be able to lead his troops afterwards, though the odds of defeat are high. 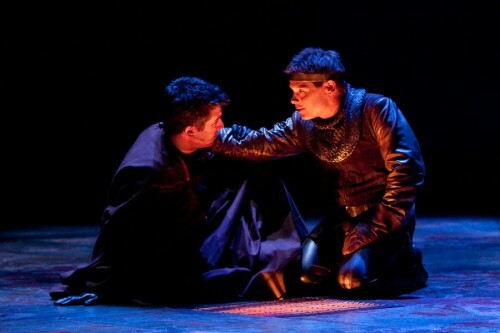 Todd Quick as Duke of Gloucester and Michael Hayden as King Henry V in the Shakespeare Theatre Company’s production of William Shakespeare’s Henry V, directed by David Muse. Photo by Scott Suchman. Muse chooses to have that threat always present. It’s never a given that England will win – the soldiers are bloodied and battered, downright pissed about being away from home - and it raises the stakes for the king. 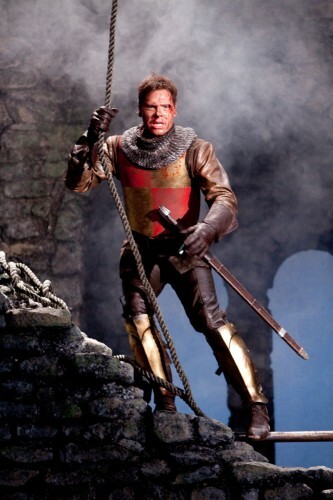 Henry must keep any personal feelings in check or risk the fate suffered by Richard. His night alone incognito with his troops is a master acting class – just watch Hayden’s expressions as he listens to the disgruntled men. There’s an emotional journey of great subtlety, simple and pure acting at its best. Afterwards, his heartfelt appeal to God not to blame him for Richard’s murder is wrenching – this Henry knows he might lose the war because of his father’s fault, which he recognizes as grave sin. But it’s only over the dead body of his old friend Bardolph (a vacant sad clown beautifully played by Floyd King) that he fully lets go of the inner anguish of duty and disappointment. To be a king is to be utterly alone. The sadness of that brief moment brought me to tears. He gets his reward in the end though, with a delightful courtship scene with Rachael Holmes’ Katherine. After all the blood and heavy weight of duty, this tender love match between the plain-spoken soldier and the exquisite princess is made realistic by both understanding the meaning of duty. I loved that Hayden plays the scene awkwardly, as a man who really believes he’s no great catch (for example, neither Olivier nor Branagh could quite let go of their need to be a player here!) and it’s his honest modesty that wins Katherine over. 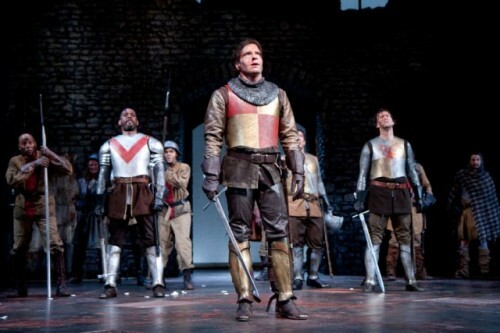 Michael Hayden as King Henry V in foreground, with the cast of the Shakespeare Theatre Company’s production of William Shakespeare’s Henry V, directed by David Muse. Photo by Scott Suchman. It’s not all Hayden, of course. Stephen Paul Johnson as the Welsh Captain Fluellen is moving throughout, the scholarly soldier whose gruffness hides a deep paternal love for the king. Darren Matthias grasps the many layers of scoundrel Pistol, from his first comic entrance, hamming it up in a seeming homage to Robert Newton (those rolling eyes right out of the Olivier film) to his last realization of a sordid, solitary future. The grudge match between these two is somehow both hysterical and full of pathos. My absolute favorite part of this production is the choice to make the battle of Agincourt an aural one. This results in riveting sequences when the lights are cut to black and the audience is bombarded with the deadly sounds of war. Sound designer Martin Desjardins should get a Helen Hayes for this work, no question – it’s heartbreaking, and an excellent choice by Muse to forgo the usual choreogaphed fight scenes. It’s a pity that I don’t feel I can recommend both of the “leadership repertory” plays, but if you can see both, by all means do it to get the contrast in kings and directorial styles. But if you can only see one, I’d urge you to make it Henry V. If this is the future of STC, I’m looking forward to more. Also saw this play and loved it! I was a little sad that the actor who played Bolingbroke in RII didn’t play Henry V, but I still think Michael Hayden did a great job. I was totally impressed by the scene where he’s incognito with his soldiers and so clearly struggling to maintain his secret identity but can’t help but defend his choices as King. Wonderfully acted scene. And I found the scene towards the end of the war–when they found the young soldier boys dead–incredibly moving. Very well done. I also loved the choice to play the scene with Katherine as an awkward soldier and not a player.